ROLLING STONE ALBUM GUIDE ***** "With High Tide and Green Grass', the band produced the best greatest-hits record of the mid '60s. 'High Tide's' 12 cuts remain the triumph of a perfect rhythm section: Charlie Watts' backbeat - casual, unerring and swinging - by then was unrivaled; Bill Wyman's bass lines fused exactly with Watt's drumming; and Richard's guitar was unabashed body music." 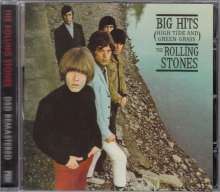 Diese Rezension bezieht sich auf "The Rolling Stones:	Big Hits (High Tide & Green Grass), LP".